Each year, automakers introduce increasingly more electronic-based driving assist systems, from electronically controlled throttle response to pedestrian monitoring hardware with autonomous brake application. Few, however, are as striking and seemingly futuristic as the new Nissan “next generation steering” system. Until now, every car sold in the US has had mechanical steering in the form of a steering wheel connected to a steering column that is at the other end connected to a steering gear that directly moves the wheels according to driver input. The new Nissan next generation steering changes all of that. In place of conventional mechanical steering, Nissan’s next generation steering uses a standard steering wheel, three ECUs, a digital camera, and wheel movement sensors to affect vehicle steering. Touted to insulate the driver from unnecessary steering-based disturbances, Nissan next generation steering combines driver input, data from a windshield-mounted camera that reads the road ahead, and road-caused wheel movement (road ruts, cross winds, etc.) to adjust for steering disturbance. In order to retain the normal mechanical steering feel, the system translates steering force — when necessary — to the driver by way of a steering force actuator mounted directly behind the steering wheel. Nissan likens the resulting steering feel to driving on rails. Don’t worry; Nissan hasn’t left anything up to chance. Should one of the three ECUs fail, one of the other two will seamlessly pick up where the failed ECU left off. In extreme conditions, if power to the system were completely severed, a backup clutch engages that connect the steering wheel and the wheels mechanically ensuring safe and direct steering. 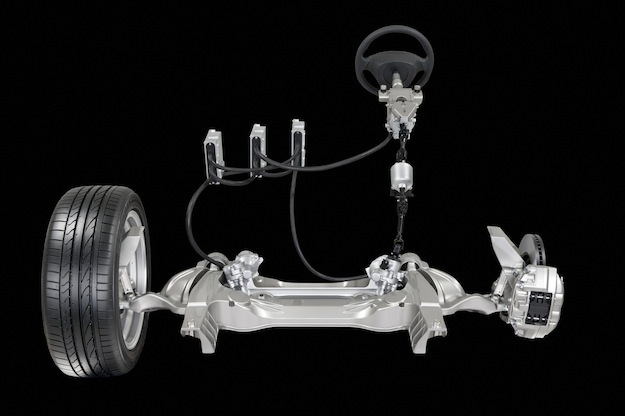 While other automakers have included electric power steering on their vehicles for several years — like Ford’s Electric Power Assist Steering (EPAS) with Pull-Drift Compensation — none have done away with mechanical driver-to-wheel input like Nissan’s next generation steering. In the case of Ford’s EPAS, more torque is added to the steering system in the case of increased steering difficulty like that of being caught in a rutted road, which lessens the need for driver input. Nissan hasn’t said exactly when it intends include its next generation steering on production vehicles but indicated that it could be soon.